A fresh silk or dried arrangement made in a rectangular vase, basket or ceramic dish is a decorative piece for any room. A wet or dry floral foam block will fit into the opening of the shaped container. A horizontal floral arrangement works well for a table centerpiece or counter top display. The greenery from the floral stems will cascade over the rim of the container, giving the illusion that the flowers are growing from the dish or basket. Cut the foam block with a knife to fit it into the rectangular-shaped container if it is too long or too wide. It should rise 1 inch over the rim of a shallow container. Secure the foam into the container using a floral tape with adhesive. Run tape over each end of the block and on to the container rim. Pour water over the foam for fresh flowers until it is saturated. Cut five lilac, gerbera daisies or hydrangea stems at a height of 4 inches. Insert one stem into the side of each corner of the foam block. Center the last stem into the top of the block. Cut nine carnation or rose stems at 6 inches. When using roses, strip the leaves from the bottom portion of the stem. Place one on either side of the center-most flower. Insert one carnation or rose at an angle between the two end flower stems. Set the remaining flowers into the top of the foam between the ends and center area. Cut and insert filler flowers such as alstroemeria, daisy poms or in-season blooms into gaps between the main flowers. Turn the rectangular-shaped container to view the arrangement from all sides. Add flowers or leaves in the areas that need them. 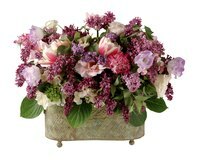 The foliage on fresh flowers will add a color and texture contrast to the arrangement.